Home » Coast to coast » Rakiba Brown, ¡Presente! Rakiba Brown at International Women’s Day speakout, March 8. 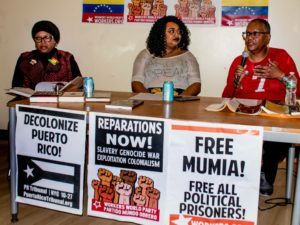 The life of revolutionary activist Rakiba Brown was remembered at a memorial celebration May 3 at Central United Methodist Church in Detroit. Friends and community activists from this city and around the world were shocked and deeply saddened to learn of her death on March 21 at the age of 61. Born Gloria Elena Brown in Chattanooga, Tenn., in 1952, Brown migrated at age 11 with her family to Detroit. She held degrees from the University of Michigan and Wayne State University, and lived in Britain for several years as well as in various cities in California, returning to Detroit after the 1994 Los Angeles earthquake. 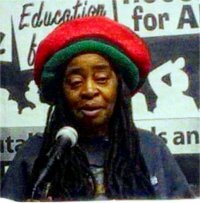 Brown was a founder and leader of the Occupy Detroit movement and helped bridge the gap between white activists and the Black community by her leadership and facilitation. 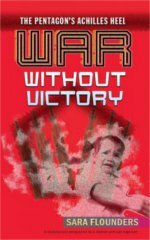 She continued her activism in the struggle to stop Detroit’s state-imposed emergency manager and city bankruptcy. 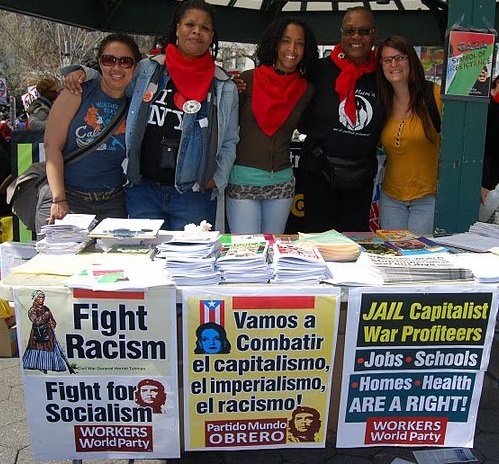 On March 8, International Women’s Day — just 13 days before her death — Brown took part in a women’s speakout against capitalism and imperialism hosted by Workers World Party. She spoke from the heart about the life-and-death struggles for survival of women in her community. She spoke in solidarity with the poorest and most oppressed women in capitalist society, and on the need to continue the fight for a new system free of exploitation and oppression.